Roger Haas led the chapter from 2000 to 2001 and focused on bringing the membership quality programs, a well written newsletter and efforts to increase membership. The chapter Articles of Incorporation were filed with the Oregon Secretary of State on May 22, 2000 and the Bylaws were adopted by the Board of Directors of the Oregon Chapter of AHSGR on May 22, 2000. Roger established a goal to increase chapter membership from 122 (in 1999) to 500 and reached out to members of the Germans from Russia Heritage Society (GRHS) to become members in both AHSGR and GRHS. Roger would later become the founder and President of the Germans from Russia of Oregon and Washington (GROW) which he led until his passing on July 23, 2016 at the age of 82. 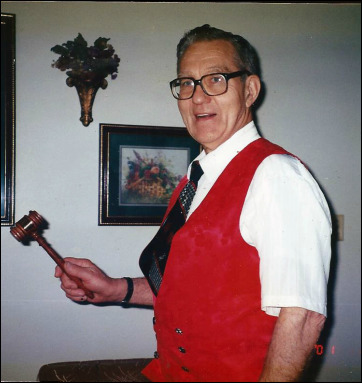 Roger Haas holds the President's gavel in February 2001. Courtesy of Roger Haas.